(16/33) TRENTON – A $138 million U.S. Army Corps of Engineers’ project to construct beaches and dunes on Long Beach Island which was temporarily suspended over the winter has resumed, with three dredges currently pumping sand in the Borough of Beach Haven and work continuing throughout the barrier island this summer, Department of Environmental Protection Commissioner Bob Martin announced. Great Lakes Dredge & Dock Company, contracted by the U.S. Army Corps of Engineers for the job of constructing engineered beaches and dunes for nearly 13 miles on Long Beach Island, had left the project last December to work on other assignments. 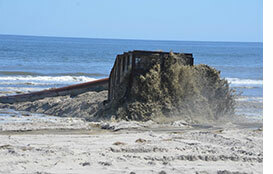 But the dredging company began returning equipment over the past several weeks to complete the work on Long Beach Island. The project began last May, with work starting in the Borough of Ship Bottom, as well as Brant Beach and other parts of Long Beach Township. much-needed beach and dunes in the Holgate section of Long Beach Township, at the southern tip of the island. Once the work in Holgate is completed, the contractor will head north to North Beach and then to Loveladies in Long Beach Township to complete the project. On March 28, a Superior Court judge in Ocean County confirmed in a ruling that the state has the legal authority to condemn property from beachfront homeowners for the purposes of shore protection. Additionally, the U.S. Army Corps has contracted with Great Lakes Dredge & Dock for beach repairs to small areas of Ship Bottom, Brant Beach and Long Beach Township that sustained damage from nor’easters in October and January. The federally-funded beach and dune project is being undertaken as part of the Christie Administration’s strategy to build a comprehensive coastal protection system to guard against the kind of destruction the state witnessed during Superstorm Sandy in October 2012. Also known as the Barnegat Inlet to Little Egg Inlet project, the beach and dune construction project is one of seven significant U.S. Army Corps beach improvement projects statewide authorized by Congress but never completed before Sandy hit. The project encompasses a total of 12.7 miles of beaches in Long Beach Township, Ship Bottom, Beach Haven and part of Surf City. The U.S. Army Corps will complete storm damage reduction projects that were being constructed in phases prior to Sandy striking New Jersey in October 2012. The contract to complete the initial construction on LBI is funded 100 percent by the federal government under the provisions of the Sandy Relief Act enacted in 2013. The project involves construction of a dune system with a top elevation of 22 feet. The beach and dune system being constructed will range from 300 to 400 feet wide and have an elevation of eight feet above sea level, better protecting the island against storm surge.